The side of Army Staff Sgt. Jonathan Charlot’s car was vandalized with a racial slur. 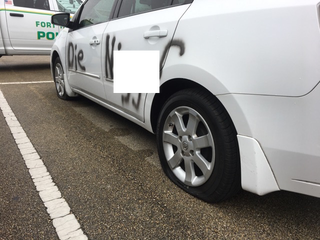 Officials at Fort Hood have launched an investigation after a soldier's car was vandalized and defaced with a racial slur at the Killeen, Texas, military base just two days before Christmas. According to the Killeen Daily Herald, U.S. Army Staff Sgt. Jonathan Charlot was getting ready to leave Killeen for Houston, his hometown, for the Christmas holiday when he got a call that his vehicle, a 2009 Nissan Sentra, had been vandalized. Charlot said that he originally thought it would be something minor, but what he discovered turned out to be much worse. Along with the slur “Die [n—ger],” all four of Charlot's tires had been slashed; the car had also been broken into and gasoline poured all over the inside. Fort Hood's Criminal Investigation Division has the vehicle while the incident is under investigation. One of Charlot's friends, John Martinez, started a GoFundMe Page to help the soldier and has raised $4,400 of a $10,000 goal over the past 10 days. “My best friend is a soldier in the U.S. Army and has worked extremely hard to protect our freedom,” Martinez wrote on the campaign description. “My best friend is one of the kindest and most generous people you will ever meet. Read more at the Killeen Daily Herald.